One of the things that has surprised me most about this year is that I now read the vegetable section in a cookbook instead of treating it like a filler between the mains and the desserts. As someone who has a hard time telling a sweet potato from a yam, this is a rather unexpected development. I'm not sure if it's meat fatigue or just a growing appreciation for a wider spectrum of flavours, but hey, I'm not complaining. It is true, adulthood holds many surprises. Last month, for the first time in my life, I ate (and loved, might I add) a plate of french beans when I was visiting a friend. His mother made a batch of wok-tossed beans with soy sauce and it was, hands down, one of the most delicious things I've eaten in 2017. I am a convert now, and with a moral superiority that I'm hoping will pass soon, I leaf through cookbooks bookmarking interesting-looking vegetable-centric dishes. 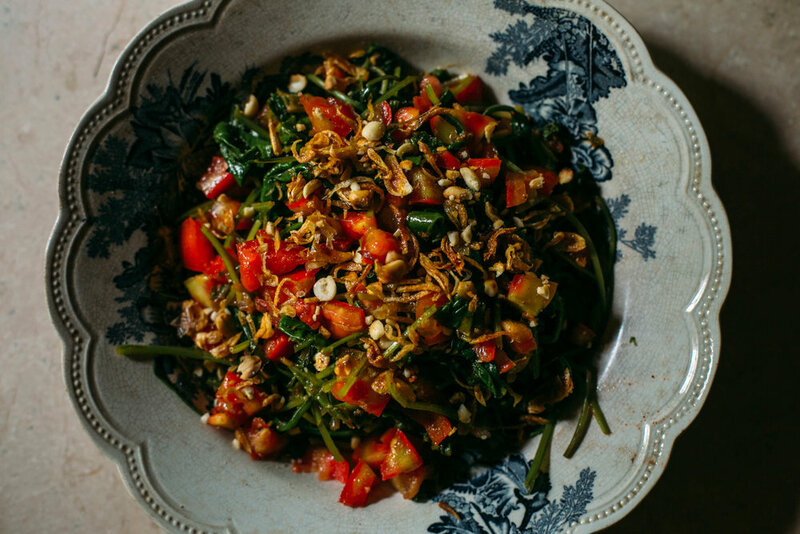 One of those finds was a Burmese salad in Naomi Duguid's Burma: Rivers of Flavour. The thing that drew me to the dish is that it's extremely straightforward. No complicated techniques — you steam a big bunch of green leaves, chop tomatoes and top with a few tasty bits. It's the tasty bits that trips you up though — frying shallots to garnish the salad literally takes more time than putting together the actual salad. But I urge you not to skip this step because it really does bring a deep savouriness (along with texture) to the table. The one piece of advice I will leave you with, however, is to pick up skinned peanuts should you have that option. I'm not sure if it's because the peanuts I used had sat around in the fridge for a while, but getting the skin off was a nightmare. Add half the onions to1/3 cup the oil in a micro-safe bowl and microwave on high for 7 minutes or until golden (might take a minute longer depending on your microwave). Give it a stir at 3 minutes. 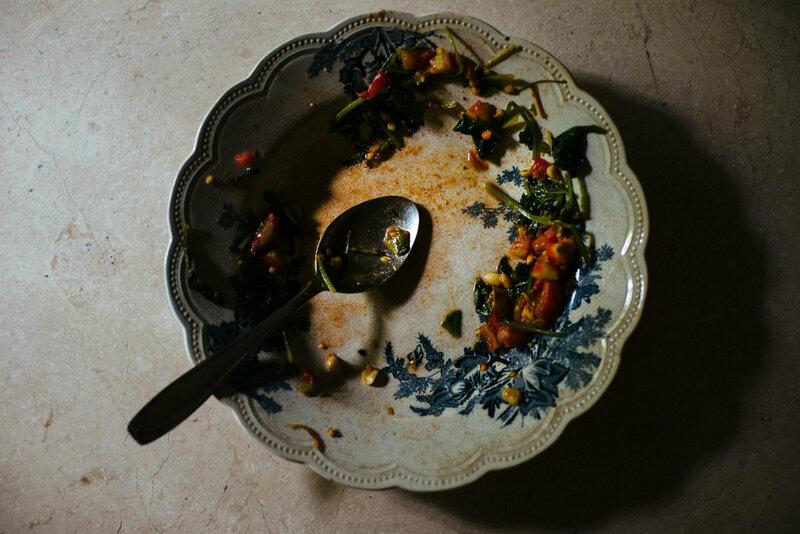 Remove with a slotted spoon and transfer to a plate lined with a paper towel. Add the remaining two tablespoons of oil and repeat with the rest of the onions. Store in an air-tight container. 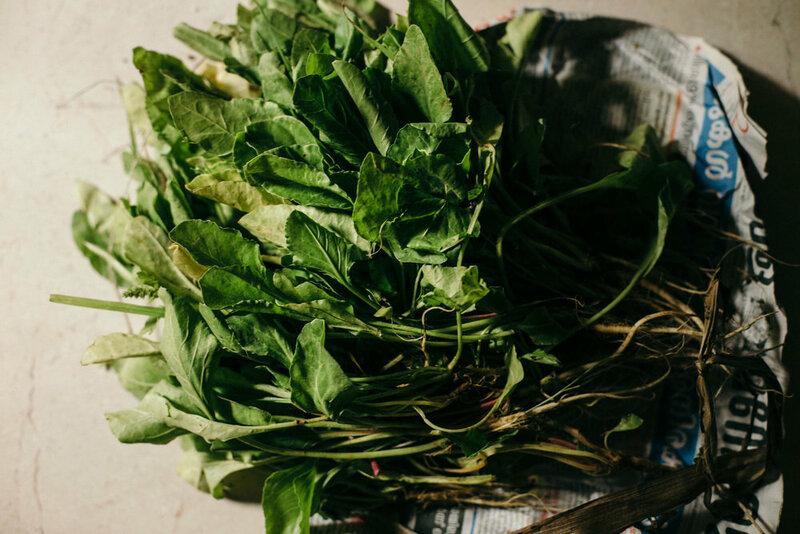 Wash the spinach leaves thoroughly and place in a large pan, cover, and let steam for 6-8 minutes on medium heat, giving it a stir occasionally to prevent it from sticking to the bottom of the pan. When ready, chop roughly into 1-inch strips and place in serving dish. Top with the tomatoes, followed by the shrimp powder, fish sauce, shallot oil, half the peanuts and half the fried shallots. Mix well and top with the rest of the peanuts, fried shallots and serve. *Here's a recipe to make the fried shallots and shallot oil. Alternatively, use the microwave method mentioned above.